“What’s a vole?” Is a question I have been hearing a lot from folks not intimately acquainted with the corner of the world where the Amargosa vole (Microtus californicus) is a star. I tell them it’s a small rodent that happens to be the most endangered mammal in the United States. Since 2010 people have been working constantly to better understand the species and bring it back from the edge of extinction. A huge part of that has been conservation champion, Susan Sorrells, agreeing to restore a portion of her land in the Shoshone spring complex area to conditions that the vole will thrive in. The vole IS extinct in Shoshone. 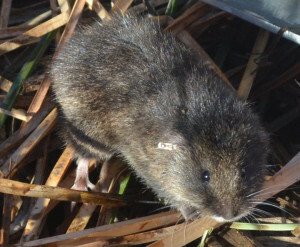 The last of the species lives in the marsh system around Tecopa, however the voles was originally discovered in Shoshone, so we know it used to live here. By creating conditions in Shoshone that will sustain voles again, we can create a “lifeboat” population of voles to maintain the species in the wild should a major catastrophe befall the Tecopa marsh population. The Lower Marsh 31, post clearing, with bulrush filling in. 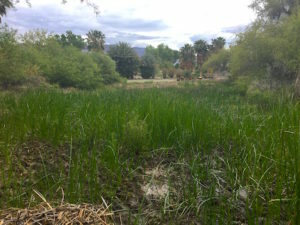 The Upper Marsh 31a, pre irrigation and bulrush transplanting. 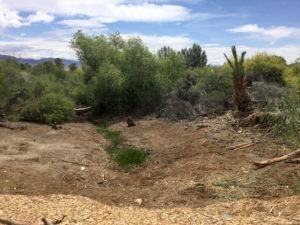 Both the State of California Department of Fish and Wildlife and the US Fish and Wildlife Service have given partnership grants to make this project happen. They have funded the clearing of two plots that total about 1/3 of an acre, opening up space to begin to grow a marshes that will be connected by a corridor of bulrush. 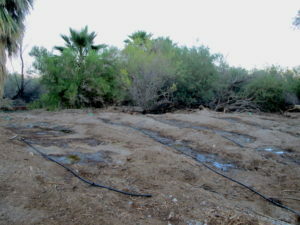 After the clearing, it became apparent that where there is water, three-square bulrush (Schoenoplectus americanus/Scirpus olneyi) will grow. 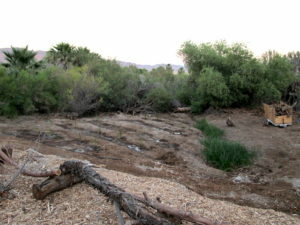 Usually, the first species that grows after clearing most of the vegetation of a given area, is not the species you want to see. While we are doing some battling of unwanted cattails in the cleared areas, we also have bulrush growing on its own – EXACTLY what the voles need to thrive. They depend on the dead bulrush duff to tunnel and nest in and they depend on the live bulrush for cover and sustenance. The lower marsh has proven especially wet and able to host bulrush. This winter we had over 50 people contribute more than 800 person hours towards planning and clearing out over 400 cubic yards of undesirable vegetative slash. Now, we just have to wait on the bulrush. It really IS exciting to watch the grass grow! And while we watch the green growth in the lower plot we will plot how to make the soil wet enough to support bulrush in the upper area. Bulrush planted and under irrigation. Looking ahead to next work season, another part of this project is creating access trails and interpretative signs for the area. Then, those who visit it, be it once, once in a blue moon, or once a day, have a ready reference for understanding not only the vole and the bulrush, but the entire spring system voles and humans both depend on in our desert.